Preheat your oven to 350 degrees Fahrenheit and spray an 8x5” loaf pan with cooking spray. In a bowl, whisk together the coconut flour, baking powder, and salt. In a separate bowl, whisk together the eggs, melted coconut oil, maple syrup, and vanilla extract. Whisk until smooth. Dump the dry ingredients into the wet ingredients and whisk until completely smooth. Scoop batter into the prepared pan. Bake for 25 minutes, or until the center is firm when tapped. Transfer to a wire cooling rack and let cool completely. Line the 8x5” loaf pan with plastic wrap (for even easier removal later, line one way with parchment paper too). In a small bowl, stir together the espresso (or coffee) and rum (or Kahlua). Slice the loaf into 16 “fingers.” Line the loaf pan with 8 “fingers,” then drizzle on about half of the coffee/rum mixture. 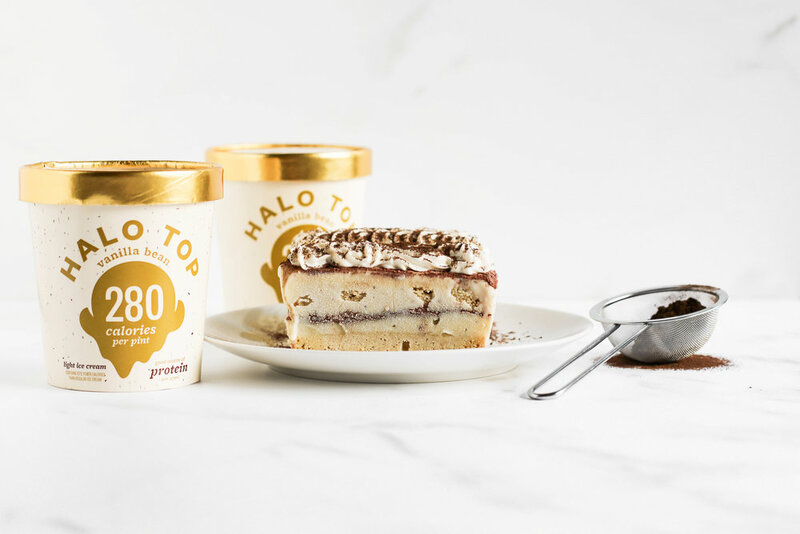 Scoop one pint of Halo Top over the fingers and spread it out to an even layer. Dust half of the cocoa powder on top of the ice cream. Place the pan in the freezer for 1 hour. Line the remaining “fingers” on top of the cocoa powder, drizzle on the coffee/rum mixture, then spread the last pint of Halo Top on top to an even layer. Dust the remaining cocoa powder on top and place the pan in the freezer for 2 hours. Slice the Tiramisu into 8 squares or 8 slices.